For payers, blockchain could be the silent infrastructure and middleware catalyst buried inside a profound restructuring in how health insurers access and leverage data. While the whiz-bang promises of medical data exchange are bandied about, core payer administrative and data and processes can also have reduced friction by eliminating or streamlining administrative processes among insurers, providers, and members. See IDC Health Insights Research Director Jeff Rivkin present “18 Prospective Blockchain Use Cases That Can Digitally Transform Payer Core Administration”. This webcast discusses the next wave of technological evolution and innovation in electronic health records. Topics to be covered include drivers, features, functionalities, capabilities, the differences between traditional and next-generational EHRs and the future outlook. Learn more about how electronic health records are evolving and will continue to play a key role as a core technology in the healthcare industry. 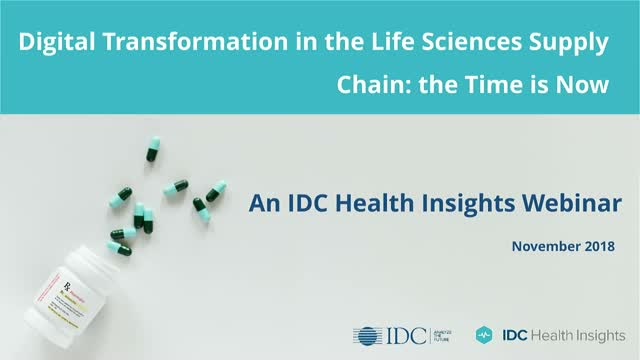 Join IDC Health Insights' Lynne Dunbrack as she explores value-based health and accelerating digital transformation. With 3rd Platform technologies, hospitals are entering an era when operations, processes, and technology are tightly linked to patients and other providers. Hospital boundaries blur, thereby triggering collaboration between sectors to enable a true integrated and personalized care service delivery model. Hospital managers (CEO, CIO, CMO) are challenged to move their enterprises to the next level — that of digital business transformation — implementing digital solutions, new business models, and innovation initiatives. •What are the steps to be taken to effectively design, acquire and implement a digital collaboration and data integration platform in healthcare? •What are the challenges you may face in an integrated care and tele medicine project? •What are the effect and clinical outcomes when data sharing is a reality and not just a vision? Patient engagement technologies play a vital role in the digital transformation of healthcare. These hold the unique potential to transform care-seeking consumers into new patients and empower existing patients to become more involved in their health and care. Tools, processes, and environments that nurture the adoption of patient engagement technologies can positively impact cost, quality, access, patient safety, and patient experience across the continuum of care. Therefore, patient engagement technologies have been mandated as an essential component of policies since the introduction of the Triple Aim and evolved into some of the most important and recent frameworks advancing health IT (e.g., the Medicare EHR Incentive Program, MACRA, QPP, MIPS, and APM). Regulatory mandates, competitive market forces, and emergent changes in health stakeholders are driving a shift to a new era of value-based and consumer-driven healthcare. It is necessary healthcare providers come up with innovative patient engagement technology strategies that also shift in response to these changes. However, despite widespread industry usage and market buzz, patient engagement is for the most part an unclear concept. There is no consensus on a clear way to plan and execute patient engagement or implement its technologies. Therefore, there is a growing need for guidance and evidence to support the application of patient engagement and its technologies to impact the digital transformation of healthcare. There continues to be strong interest within the life science and healthcare industries on innovations that can yield new actionable insights and improve operational efficiencies. With a full spectrum of validated applications spanning multiple industries, AI promises to deliver new capabilities to the life science and healthcare industries today. In this webinar, we will discuss AI trends, the evolving AI landscape in the life sciences, AI areas gaining early traction, and key factors driving and hindering adoption. This webinar will review the research highlights for 2018 that include topics such as analytics, patient engagement platforms, convergence of health and social care, and population health. The results from recently completed research on the use of Artificial Intelligence and predictions on future adoption will be shared. IDC Health Insights' Healthcare Payer IT Strategies research service provides in-depth coverage of key emerging business trends and technologies that drive emerging U.S. healthcare payer business objectives and impact payer information technology (IT) portfolios and investment. Major market forces — an aging population, increasing prevalence of chronic conditions, access issues due to staffing shortages, and other pressing industry challenges — are compelling payers and providers to invest in connected health technology to deliver care more efficiently and to engage consumers to manage their health. Connected Health IT Strategies service provides in-depth coverage of rapidly evolving connected health technologies use cases and their underlying technologies, which will play a vital role in the transformation of fee-for-service to value-based healthcare. The complexities and uncertainty of the present day combined with the pace of change and innovation only seem to be making healthcare more perplexing than promising for providers. The Provider IT Transformation Strategies service offers in-depth coverage of rapidly evolving use cases with a focus on the interrelations between providers, patients, and technologies that help providers meet the challenges of a market transitioning to value-based health.